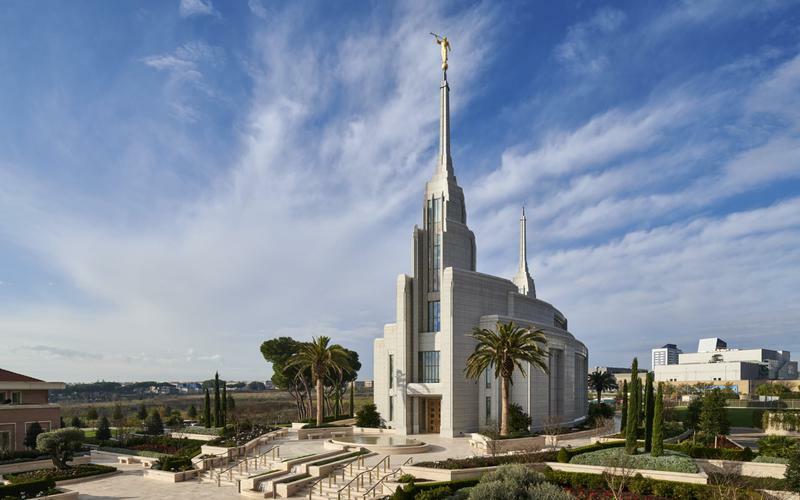 It was in the summer of 2005 or 2006 in Temple Square when two sister missionaries from Italy explained the gospel to an Italian man and his wife. They showed the couple the grounds around the Salt Lake Temple. All too soon, the man and his wife had to leave. At this time, we don’t know who those sisters were. They were, however, doing the happy work that all missionaries do, discussing the gospel of Jesus Christ with all willing to hear, comporting themselves with dignity and honor and joy. These sisters didn’t know then the huge impact their interaction would have. I heard about the sisters from Elder Gordon H. Smith, who is spending the weekend presiding over the Stake Conference in Annandale, Virginia. Though Elder Smith claims to have repented of his political past, he was a U.S. Senator from January 1997 to January 2009. One day then-Senator Smith received a call from Salt Lake City. A General Authority from Europe would be in the DC area to assist in reorganizing a stake. Would Senator Smith be willing to give this General Authority a tour of the capitol? The General Authority was a fellow named Dieter Uchtdorf. Senator Smith thoroughly enjoyed the hours they spent, impressed by the enthusiasm Elder Uchtdorf had for history and other aspects of the United States. In 2006, a few years later, Senator Smith’s assistant poked her head into his office. She explained there was a fellow on the phone from Salt Lake. But she didn’t think the Senator wanted to take this call. “What’s the fellow’s name?” Senator Smith asked. Senator Smith took the call. Elder Uchtdorf explained his concern was for members of the Church in Italy. Elder Uchtdorf was now an Apostle, with responsibility for the Church in Europe. Italy did not permit members of the Church full recognition. Marriages performed by Bishops were not recognized. This lack of recognition made it difficult to built chapels. This lack of recognition made it impossible to consider building a temple. It so happens that Washington DC is a place where friendships are made. Young people working on behalf of their respective nations become friends. In time many of those bright young friends become senators and ambassadors. It happened that Senator Smith was friends with the individual who at that time was the Ambassador from Italy. Calls were made, and soon it was arranged that Senator Smith would travel to Italy to discuss this matter with the empowered individual in the Italian government, who happened to be a woman. Senator Smith called Elder Uchtdorf to report his success in arranging a meeting. Elder Uchtdorf was pleased to report that his calendar was entirely clear for this and that he would be happy to accompany Senator Smith, if that was acceptable. A few days later Senator Smith and Elder Uchtdorf sat in the office of the woman in charge of religious matters for the Government of Italy. She introduced them to her guest, who was a professor specializing in religions. They greeted Senator Smith and Elder Uchtdorf in exquisite English. Senator Smith opened by speaking of how Italy and the United States share membership in the North Atlantic Treaty Organization (NATO), and referred to the articles of that organization. Core to that alliance is the presumption of shared values. As it turned out, there were thousands of Italians at the time who belonged to the Church of Jesus Christ of Latter-day Saints. Yet they were not being accorded recognition commensurate with their religious needs. Elder Uchtdorf continued the discussion, explaining the history of the Church in Italy, which had started in 1860 with the arrival of Apostle Lorenzo Snow. Elder Uchtdorf detailed the problems the Church was facing in Italy due to lack of recognition. When he was done, the woman in charge paused. She wasn’t sure if it was possible. If it was possible, she wasn’t sure it was the right thing to do. With that said, she turned to the Professor of Religion and asked his opinion. The Professor explained that he and his wife had spent the prior summer in the United States. During their vacation, they had visited Salt Lake City. While there, he and his wife had toured the grounds of the temple and been escorted by two Italian women who had traveled to the United States to convince Americans to believe in the Lord, Jesus Christ. The Professor spoke of the kindness, intelligence, and presence of these two young women. If the Church of Jesus Christ of Latter-day Saints could produce such youth, then he entirely favored moving towards full recognition for the Church in Italy. “We could start tomorrow,” said Elder Uchtdorf. Alas, bureaucracy does not turn on a dime. It took roughly two years before the Church was accorded full recognition in Italy. On October 4, 2008, I happened to be alone in my living room watching General Conference. My husband was downstairs watching the live feed on his computer. My daughters were still upstairs getting ready. President Monson stood to give his opening remarks. Not obvious to me, President Uchtdorf was seated on the stand and Senator Smith was seated in the front rows of the Conference Center. I later learned from a friend who was a missionary in Italy in October 2008 that the screaming and shouting in Italy continued for many minutes. Elder Smith recalled that when President Monson uttered the word, “Rome…,” the feeling in the Conference Center was absolutely electric. Senator Smith’s heart was full and his eyes filled with tears. Even so, Senator Smith saw President Uchtdorf look directly at him and give him a thumbs up sign of triumph. The Conference Center filled with laughter. At that moment, my family arrived in the living room to find out why I was screaming. “There’s going to be a temple in Rome!” I declared. Then we heard the laughter in the Conference Center on the broadcast. “Why are they laughing?” my daughter asked. My husband answered. “When President Monson announced the Rome temple, Mom screamed so loud that they heard in it Salt Lake. So they are laughing.” We giggled, to think that my screams, no matter how loud, could be heard 2000 miles away. But I had no idea why people were laughing, because I’d been screaming, my eyes full of tears. Somewhere there were two other returned missionaries, though these sisters were Italian and had served in Salt Lake City. I’m sure they were with their friends, screaming and hugging, knowing that Italy would soon have a temple, as so many thousands have yearned for over the years. Those two young women may still not be aware that it was their shining example that made the difference. It was because of them that the Professor of Religion was sympathetic to the Church. It was because of them that he yearned to see a temple built in his country, even though he himself was not a believer. I know both Elder Uchtdorf and Elder Smith would love to know who they can thank for softening the heart of the man upon whom hung the decision regarding whether or not to grant the Church recognition in Italy. So spread the word and lets see if we can’t figure out who those ladies are, and in so finding, know better the chain of teachers and friends and missionaries that helped those young ladies be at Temple Square at that crucial moment. Aww, what a wonderful story. Truly it’s like the ripples on the pond. I love hearing about miracles like this! Thank you so much for sharing it! The Lord’s hands is guiding His work. If Elder GH Smith can track down the professor (maybe going through the now former govt minister he took the meeting with), and get a date for that SLC visit, or at least a month/year…. then Elder Uchtdorf could have the records searched to find the names of whatever Italian sisters were in the Temple Square mission in that time frame. There could have been more than one Italian sister companionship at the time, and even a few more if the exact date can’t be pinned down. But it could likely be narrowed down to a handful or a dozen. I seem to recall hearing/reading that Temple Square missions are merey short assignments (a few weeks at most) for sisters who are actually assigned different missions. Mission Presidents then recommend their most qualified on-the-ball sister missionaries to temporarily be transfered to the Temple Square Mission. Is that how it used to work or still works? Hi, I was one of the two sister missionaries who gave that tour, I served from July 2005 to January 2007. I am from Verona, Italy. I just went to the Rome Temple Dedication and felt prompted to respond to your article. Some friend of mine shared this article with me and asked me to contact you. I just didn’t feel like responding yet cause I couldn’t remember with what other Italian sister I had given this tour because we were not companions. We were put together just for that tour. I’m goin to see in my journals when I can to let you know the other name. I am grateful I could be helpful in some way for the building of this marvelous temple.